Having a custom pool house is an excellent way for you and your family to easily relax during the summer months. However, the process of getting to the point where you finally have the pool house in place might be a bit tricky if you are not prepared to handle it well. There are many considerations that one has to keep in mind when designing the pool house, one of which is how to make the most out of limited space. When you intend to construct a regular pool house when you have a lot of space to work with, you can afford to even do it on your own if you want to. Well, the fact that you have lots of space to work with means that even if you make a few mistakes in the design or construction, you are likely to be able to correct them at some point. The same cannot be said for when you have a very small amount of space to work with. The margin for error is much smaller in such cases, which means that you should aim to get it right the first time. • In the initial design phase: When you have very little space to work with, it’s critical that you get it right during the initial design phase. Otherwise, you will end up with a structure that will consume too much space. When working with experienced contractors who have the right tools for the job, you can be sure that they will be able to do this with ease. • They can give you some ideas: If you have never designed or built a pool house in the past, you are unlikely to know of the challenges that lay ahead, which in turn means that you may not be able to prepare for them. When you consult a contractor, the fact that they have seen it all means that they know what to anticipate. This will reduce both the overall cost of the project as well as the amount of time it takes to complete. If you have little space to work with, using it for too many things will definitely be a problem for you. Rather than doing this, you should consider designing a pool house that can serve more than one function. For instance, suppose you need space for storage of your lawn mower and other things that you usually store in the garage, you could design your pool house to have such storage facilities. In most cases, this will require you to have some ingenious design strategies, which is where the contractor will also come in handy. When space is extremely difficult to come by, you might have to start thinking laterally about some of the features that you normally find in the pool house, so that you can then decide on which ones to get. For instance, if you are likely to be using the pool as a family, there might not be any need for you to install showers in it since you can use the ones in the house. The same goes for other facilities such as changing rooms. Installing them when you have little space and when you are highly unlikely to use them would not be wise. Sometimes, the layout of the pool can be used to maximize the space it occupies. This involves first taking into account the shape of the space you will be working with, and then trying to come up with a design that can fit it. It’s almost always necessary to use custom pool house design in such settings. Using a tried and tested design might not be ideal particularly if you are working with odd space shapes. In summary, you don’t need to be hesitant about designing a pool house when you have little space to work with. All you need is a bit of creativity, and you should be able to pull it off. If you decide to have a pool on your property, your plans should not end with the pool design; you need to think about a structure to complement it. 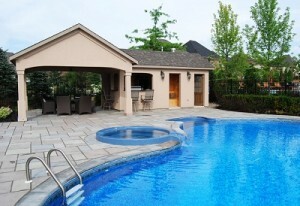 A good pool house is the perfect way to ensure that you and your guests enjoy the best swimming experience. By setting up your pool house in style, you can relax before and after swimming. You can even create a structure that you can enjoy even when you are not planning to swim. Nothing spells luxury more than knowing that after enjoying the shimmering turquoise water you can cozy up with a fluffy towel and a cold beverage a few steps away. A well-designed custom pool house can boost your swimming experience a great deal. This might seem like an extravagance but when you consider the results, it is a choice worth making! Fortunately, you do not have to build or even design the pool house yourself, as there are many experts ready and willing to help. Home centers even offer pre-made fixtures if you are on a tight budget. However, choosing the custom option will bring you more pleasure because you get exactly what you need. The following tips will help you to turn your outdoor area into the perfect retreat. Before building any structures on your property, you have to find out about the local building codes. 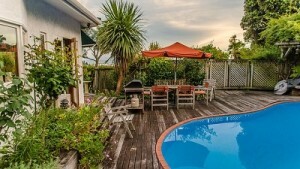 The best thing about using an experienced local builder is that you have the services of someone who is well informed. It is important to know that a pool house has to be a certain distance from the pool. In most cases, the depth of the pool will determine how far the building should be. Make sure that your structure falls within the guidelines to avoid problems. It is a good idea to consider the home’s architecture when planning the pool house. While the structure does not have to be identical to the house, it should be close enough to look like it belongs on the property! If you have a traditional style home, a structure that is too modern might look like it belongs in some other yard. Following the lines, style and proportions of the main house will help to provide visual cohesion. Think about the proximity of the structure to the main home and remember that cohesion will go a long way in improving the value of your property. When designing the cabana or pool house, it is a good idea to provide both indoor and open-air shelter. Plan to create a space where you and your guests can enjoy the outdoor fresh air while remaining sheltered from the hot sun. A good enclosed interior space can be the perfect place where swimmers can enjoy a cold drink. Your pool house can double up as an entertainment area where guests can relax whether or not they want to swim. There are some beautiful designs available and you can talk to the contractor about your needs or how you want to use the space. The issue of privacy is important when designing the pool house. Guests should be able to change into or out of their swimsuits without worrying about prying eyes. A good pool structure should be oriented in such a way that it is as private as possible. Consider including features like privacy walls, screens, shades or blinds and etched or frosted windows. Your guests will be more comfortable using the space when they do not have to feel like they are on display. The location of the pool house in relation to the main house or the neighbor’s property will determine how private it will be. The perfect pool house should allow you to use the pool area without walking back and forth into the main house. For this to happen, you should ensure that you have adequate storage space in the structure. Carrying around pool gear can be inconvenient and cumbersome and it helps to have somewhere to store the items close to the pool. Installing cabinets, shelving, storage benches and other fixtures will keep the space functional and clutter free. You can also stock the pool house with a mini-fridge, dishware, drinks, snacks and other items like extra towels. Allow ample space for entertaining and remember that having pool parties is a great reason why you should have the pool house in the first place! Some comfortable seats, coffee tables and even a bar can help to transform this space and make it more functional. Choose waterproof surfaces and fabrics for your pool house. Pool users should be able to use the furniture even when they are in their wet swimsuits. To get the best results from your structure, make sure that you get the services of an experienced pool house designer. A custom designed structure will ensure that you get the most out of style and functionality! If you love spending time outdoors but rarely have the time to travel or go to the beach, the good news is you can create the perfect getaway right in your backyard! The ability to spend the hot summer days outdoors is the best reason for building a structure that you and your family will love. There are several ways to usher the summer in style and they include building pergolas, awnings, cabanas and shade sails among other structures. 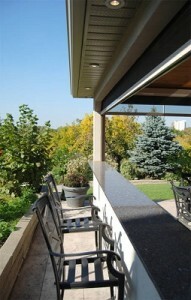 Your outdoor area can be the best living area in your home. Following are some tips that will help you when planning the perfect custom outdoor structures. To get maximum use out of your structure, you have to think about weather protection. Remember that there are different seasons in the year and if you can use the structure during sunshine, wind or showers, you will get much more from it. It helps to remember that the weather at night can get chilly even during the summer months. When building with the weather in mind, it is important to choose weatherproof building materials. Make sure that your outdoor structure has a ceiling that provides rain protection as well as protection from extreme heat. The best part about outdoor structures is that they come in a wide range of designs to suit any home. This means that your custom structure can come in any size, shape and color. Think about a structure that will complement your home and your landscape. There are different options to suit any budget whether you decide to use wood, PVC or canvas. If you want a structure that is flexible, you might consider using materials that are light and easy to move. A good designer should be able to work within your budget to come up with a structure that will suit your needs. When designing the outdoor structure, you need to decide whether to go permanent or temporary. This will depend on a number of factors including your budget, intended use and how long you plan to live in the home. Consider your current and long-term needs and remember that ultimately, the structure should add value to your property. A permanent structure might cost you more, but the fact is that you can end up with a beautiful outdoor space where you can entertain or simply enjoy spending time with the family. Look at several designs and choose a structure that works well with your home style. To get the most from the outdoor atmosphere, you should think about more than just a few deck chairs next to the pool or under the trees. Creating an enclosed all-weather outdoor room will be a much better option. By covering or enclosing part of your outdoor space, you can have a home extension that will give you the perfect “indoor-outdoor” feel. You can benefit from the protection of an enclosed room while getting the feeling of being outdoors. There are custom-made structures that come with roof louvres, fixed awnings, and outdoor walls that can be manually or automatically operated. When designing the outdoor structure, privacy should be at the top of your mind. The last thing you need is idle neighbors spying on you when you are entertaining or trying to get some R&R! Creating privacy is especially important if your property is on a hill. Talk to the contractor about the best materials for enhancing privacy while still creating an attractive structure. A covered pergola can offer privacy while still letting in sufficient sunlight. Think about the best location for the structure when thinking about the privacy issue and remember that there may be some zoning regulations to consider. When designing the outdoor structure, it is important to think about the best way to create cohesion between the home interior and the outdoors. There are structures that will help to visually extend your building’s architecture to blend into the outdoor space. By making the structure look as if it is a part of the home, you can create the best overall look for your property. Think about your home’s color scheme and the architectural details when designing the structure. A structure that blends in well with the home will help to increase the value of your property. It is important to get the right scale when designing your outdoor structure. The builder should be able to come up with a structure that works perfectly when the amount of space you have in your backyard. Getting the right scale will also mean taking into consideration factors like the structure’s door and window height. The best structure should fit your individual needs whether you want something small or a large space where you can entertain guests. Your outdoor oasis can bring you great pleasure, not just during summer but all year round! Toronto, Canada (PRWEB), July 3, 2014 – Cedar Wood Structures Inc. (www.CedarWoodStructures.ca), the Greater Toronto Area’s leading provider of custom outdoor living structures, custom cabanas, and residential renovation and condominium improvements, is announcing its top landscaping ideas to provide homeowners with potential concepts that could elevate a backyard’s aesthetic. Dumitriu explains that simple landscaping projects can sometimes have a definite impact. One relatively simple landscaping idea homeowners can implement is to make an entrance. Creating a clear, cleverly decorated walkway to the backyard is both functional and visually appealing, with stone usually being a good choice. For more courageous homeowners, Dumitriu suggests installing a custom pool cabana and jazzing it up with an outdoor bar enclosure. Custom pool cabanas in Toronto in particular are becoming more popular, as homeowners want to spend as much time outside as possible during what is a short summer season. Cedar Wood Structures Inc. specializes in designing, building, and delivering quality custom pool cabanas, gazebos, garden sheds, studios, outdoor bars and kitchens, pergolas and trellises, custom decks, and other outdoor living structures. Cedar Wood Structures Inc. also specializes in residential renovation, condominium improvements, and general contracting. With over 20 years of construction experience, company owner/operator Val Dumitriu holds a master’s degree in civil engineering and is a certified building inspector. Cedar Wood Structures Inc. serves the Greater Toronto Area, including Mississauga, Brampton, Caledon, Vaughan, Markham, Newmarket, Aurora, Oakville, Burlington, Milton, Richmond Hill, Pickering, Ajax, Whitby, and Oshawa. To learn more about Cedar Wood Structures Inc., visit the company’s web site at www.CedarWoodStructures.ca or contact Cedar Wood Structures Inc. at info@cedarwoodstructures.ca or toll-free at 1-888-993-8855. Toronto, Canada (PRWEB), April 17, 2014 – Cedar Wood Structures Inc. (www.CedarWoodStructures.ca), the Greater Toronto Area’s leading provider of custom outdoor living structures, custom cabanas, and residential renovation and condominium improvements, is offering an expert opinion on the value of outdoor renovation projects. Although the inside of the home tends to be the focus for renovations, particularly when homeowners are thinking of adding value to their house, it’s important to remember that outdoor improvements are just as important and can also yield significant returns. Dumitriu suggests thinking of it from a practical point of view; the first thing a buyer sees is the outside of a home, meaning it’s what gives sellers that initial flush of confidence to like the rest of the house. He also notes that adding something like a wooden custom deck gives homeowners a return of close to 90%. Toronto, Canada (PRWEB), March 20, 2014 – Cedar Wood Structures Inc. (www.CedarWoodStructures.ca), the Greater Toronto Area’s leading provider of custom outdoor living structures, custom cabanas, and residential renovation and condominium improvements, is announcing the top benefits of building a custom backyard cabana. Dumitriu explains that homeowners do not need a large backyard pool or lakefront view to enjoy the benefits of a custom cabana. Whether they’re looking for a place to get out of the sun or change out of a wet bathing suit, a sheltered barbeque area, sinks, bars, or an enclosed room, homeowners should consider building a backyard cabana. Dumitriu notes that summers in the Greater Toronto Area can also feel too short, which makes the construction schedule of a cabana that much more important. Cedar Woods Structures offers a variety of standard and prefabricated outdoor pool cabanas. The company has prefabricated, ready-to-go stucco finish walls; even customized cabana walls are prefabricated and preassembled for a fast and efficient on-site installation. “Whether it’s a place to relax, host parties, or extend the living area by creating a home office, a backyard pool cabana gives the feeling of escape without actually having to get away—and a great way to enhance a property without making any changes to the home,” Dumitriu concludes. Cedar Wood Structures Inc. specializes in designing, building, and delivering quality custom pool cabanas, gazebos, garden sheds, studios, outdoor bars and kitchens, pergolas and trellises, custom decks, and other outdoor living structures, such as landscaping and pools. Cedar Wood Structures Inc. also specializes in residential renovation, condominium improvements, and general contracting. With over 20 years of construction experience, company owner/operator Val Dumitriu holds a master’s degree in civil engineering and is a certified building inspector. Cedar Wood Structures Inc. serves the Greater Toronto Area, including Mississauga, Brampton, Caledon, Vaughan, Markham, Newmarket, Aurora, Oakville, Burlington, Milton Richmond Hill, Pickering, Ajax, Whitby, and Oshawa. To learn more about Cedar Wood Structures Inc. visit the company’s web site at www.cedarwoodstructures.ca or call 1-888-993-8855.